Liverpool returned to the top of the Premier League with a vital, morale-boosting 3-0 victory against Bournemouth at Anfield. The Brazilian was alert from the first whistle, making a smart stop from Ryan Fraser’s early curling shot towards the far post. Produced another fine save to tip Lys Mousset’s powerful near-post drive out for a corner late on. Collected his 14th Premier League clean sheet of the season with relatively little else to do, leading the way in the Golden Glove stakes. Having overcome the illness which saw him struggle against West Ham, Milner was much sharper here and played an important role in Liverpool’s relentless start, linking up well with Salah in the final third. It was his excellent delivery which picked out Sadio Mane for the opening goal, and his advanced starting position largely pinned back Fraser, Bournemouth’s most dangerous attacking outlet. Certainly one of Matip’s strongest performances of the season, his progressive passing contributed to Liverpool’s slick build-up play, and he almost picked up an assist with a pin-point, raking pass to send Roberto Firmino through on goal. Defensively, he remained switched on throughout and was well positioned to sweep up Bournemouth’s sporadic attacks, including a crucial block in the box to cut out Andrew Surman’s threatening cut-back. After playing through illness during Liverpool’s two frustrating draws of late, Van Dijk was back to his usual imperious self here, strolling through the game with ease as Liverpool defended with confidence and assurance. Delivered several of his trademark, raking cross-field balls to spread the play, and dominated his aerial battles. Sprinted the length of the field on the counter-attack late on, and ought to have been on the score sheet had Firmino slid the ball into his path. One of Liverpool’s most consistent performers this season, Robertson has suffered a minor dip in form over the past couple of games but regained his mojo against Bournemouth with a typically industrious performance, full of quality in the final third. 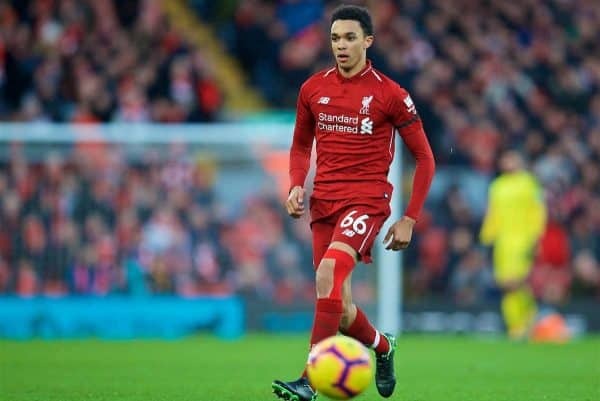 Bournemouth were willing to sacrifice space out wide, and Robertson showed why this is a risky strategy given his ability to create clear-cut opportunities. His delightful, chipped through ball set up Gini Wijnaldum for Liverpool’s second goal- the Scotsman’s eighth assist of the season. Much of Fabinho’s best football this season has come while playing alongside Wijnaldum, and while the two started together here, the Brazilian was the deepest of Liverpool’s midfield trio and thrived in the No.6 role, providing the basis to allow Wijnaldum and Naby Keita to get forward and join the attack. His distribution was excellent, varying between accurate long passes out to the flanks, and short, incisive passes often into Mohamed Salah’s feet. Always on the front foot, Fabinho cut out numerous Bournemouth attacking moves and made a perfectly-timed tackle on Fraser in the box late on to help preserve Liverpool’s clean sheet. On the back of two mixed performances in which Keita produced moments of almost-match-defining quality, he put together one of his most accomplished all-round displays for Liverpool on this occasion, and benefited from playing in front of Fabinho and Wijnaldum. Defensively, Keita carried out his duties and tracked back brilliantly to halt Jordon Ibe on the counter-attack in the first half. A magnificent, defence-splitting pass fed Firmino to set up Salah for the third goal, and a well-judged challenge on Fraser before a slide-rule ball to send Salah racing forward on the counter soon followed. A very encouraging step forward for Keita, who can play a key role for Liverpool during the run-in if he can produce this level of performance on a regular basis. Liverpool badly missed Wijnaldum’s presence in midfield against West Ham, and on his return to the side he showcased exactly how pivotal a figure he is for Jurgen Klopp. 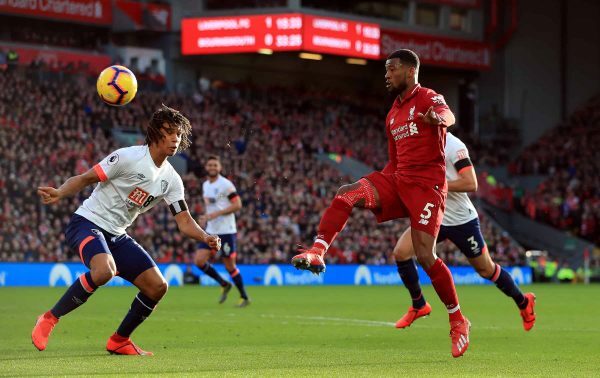 In a more advanced, free-roaming role than usual, Wijnaldum was his usual diligent self, while also frequently making well-timed surges into the box. His persistence was rewarded as he made it 2-0 with an audacious, dinked finish after latching on to Robertson’s lobbed pass. It was only Wijnaldum’s second goal of the season- his 10th in total for the club- and demonstrated how he can offer a considerable attacking threat, as well as his outstanding defensive contribution. Stationed out on the right rather than through the middle, Salah was integral to Liverpool’s attacking play and constantly made himself available, driving at Bournemouth’s back line and looking for the killer ball, even if it did not always come off. Salah was unfortunate not to score with a spectacular volleyed effort from the edge of the box in the first-half, and coolly slotted the ball into the bottom corner in the second-half for his 20th goal of the season- the first Liverpool player to do so in consecutive seasons since Luis Suarez. He very nearly added another soon after, crashing his shot against the bar after more good work from Firmino. Having opened the scoring early on in both of Liverpool’s draws against Leicester and West Ham, it was Mane yet again who made the breakthrough, dispatching a bullet header past Arthur Boruc from Milner’s cross, despite a slight suspicion of offside. 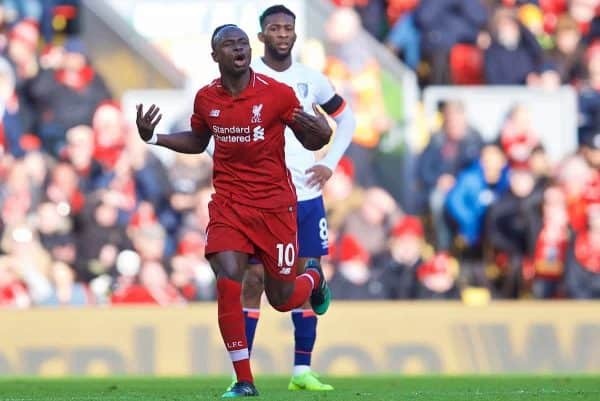 It was the fourth successive game in which Mane has scored, taking his tally up to 13 for the season in all competitions, and he ought to have added another as he headed narrowly wide from Wijnaldum’s lofted pass in the second-half. Firmino was one of Liverpool’s most frustrating performers against West Ham, and as is so often the case, how he performs tends to have a significant influence on how well Liverpool function overall. Here, Firmino was much sharper with his passing, taking care of the ball and finding pockets of space as the spearhead of Liverpool’s front three, rather than as a No.10. Showed great awareness and seflessness to flick the ball into Salah’s path for the third goal, rather than opting to shoot himself. Almost scored on his return to the side, firing at Boruc rather than electing to cross. His availability will be of great relief to Klopp, and he now has another 10 days before Bayern Munich to regain full match-fitness. Couldn’t quite gather the ball on the counter-attack late on, but made his presence known and showed a hunger to get himself on the scoresheet. Barely involved during the final few minutes in stoppage time. 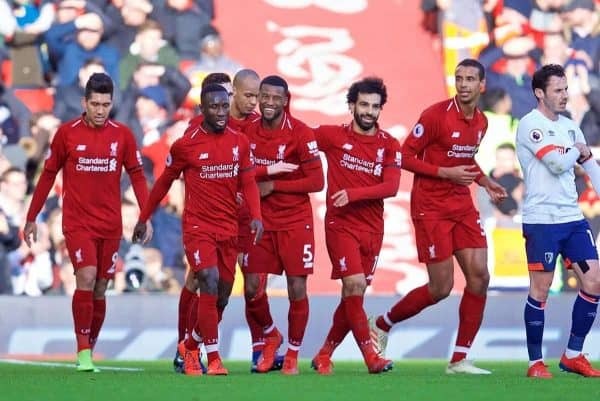 Fielding arguably the strongest lineup available to him given the current state of the squad, Klopp struck the perfect balance in midfield, as Fabinho, Keita and Wijnaldum dovetailed to great effect. A return to the familiar 4-3-3 shape of last season saw Salah much more influential than he has been in the last couple of games, while the linkup with Firmino was back to its brilliant best. 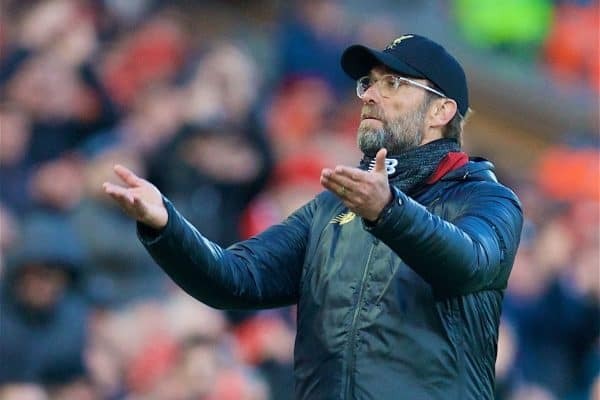 The manager will be delighted with the assured manner of the victory and the way Liverpool kept up a relentless tempo from the first whistle to dispel the sense of nerves which has been much talked of after the last two disappointing results.